Learn more about EMESS from JUST. JUST's photography includes a series called "On the Run With...," which documents street art actions across the urban landscape. 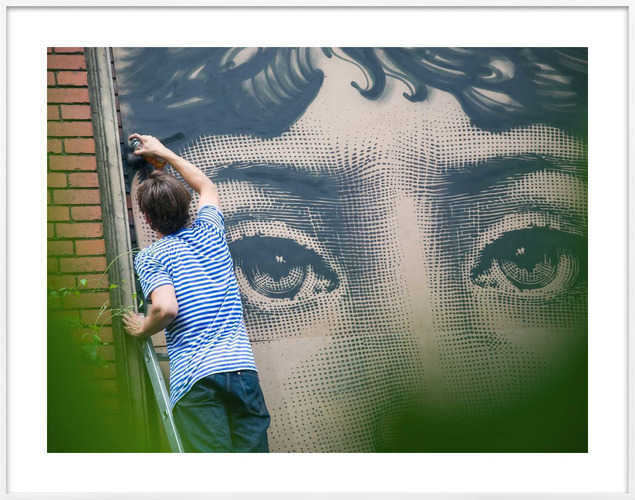 JUST captures Berlin-based artist EMESS as he finishes a mural in his signature romantic style. Boris Niehaus, also known as JUST, works as both a photojournalist and graffiti artist, literally living on the edge to create his adventurous works. He has painted rooftops from Berlin to Bangkok, and has photo evidence to back his claims. For more than a decade, JUST has been an active member of the European urban art scene, leaving his own mark while also documenting the work of his close peers.